6xHis tagged HIV-1 gp120 (Du422.1) (Clade C) protein (amino acid 40-506) (Genebank No. DQ411854). Store at 4 degree C. DO NOT FREEZE. Stable for 1 year from the date of shipment. Non-hazardous. No MSDS required. Small volumes of HIV-1 gp120 recombinant protein vial(s) may occasionally become entrapped in the seal of the product vial during shipment and storage. If necessary, briefly centrifuge the vial on a tabletop centrifuge to dislodge any liquid in the container`s cap. Certain products may require to ship with dry ice and additional dry ice fee may apply. 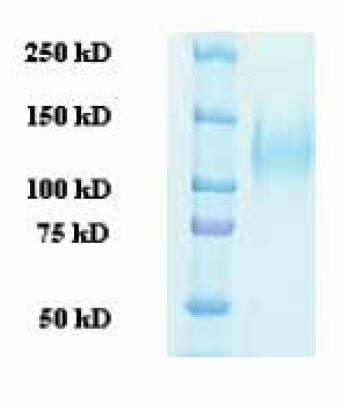 Viral protein purified from 293 cell culture. NCBI/Uniprot data below describe general gene information for HIV-1 gp120. It may not necessarily be applicable to this product.